Full mouth tooth loss can be devastating, but thankfully, the dedicated dentist and team at Katy Family Dentistry are here to help. We offer a range of tooth replacement options, including traditional dentures, implant supported dentures, and the innovative All-on-4 treatment method. If you’re hiding your missing teeth in personal and professional situations, let our dedicated dentist, Rodney L. Allen, DDS, and his team give you the confidence to share your smile again. To get started with your implant supported tooth replacement plan, call our dental office in Parker to schedule your tooth replacement consultation. We’ll review all of your treatment options and help you to find the best solution to meet your needs and achieve your goals. 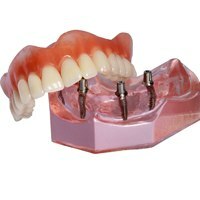 Removable dentures are composed of a gum colored base material that supports a full row of replacement teeth. The base is molded to fit against the gums, creating suction that holds the denture in place. Traditional implant supported dentures use the same base material to support replacement teeth, but rather than relying on suction between the denture base and soft tissue for support, a series of implant posts are placed along the jaw line to provide support for these dentures. All-on-4 dentures combine the stability and longevity of an implant-retained denture with state-of-the-art technology and a less-invasive implant placement procedure. 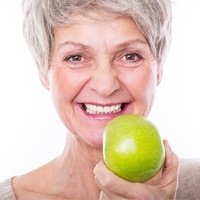 All-on-4 dentures typically mean you can forego the preparatory services like gum and bone tissue grafts that are often necessary prior to traditional dental implant supported denture plans. 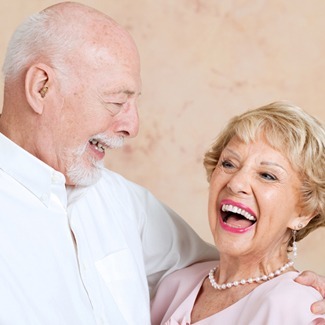 Unlike removable dentures that can leave you struggling with a slipping and sliding smile, All-on-4 dentures give patients the stability to speak, chew, and smile with total confidence. Traditional dentures need to be repaired, relined, or replaced every five to ten years on average, but your All-on-4 denture will last for two decades or longer with proper care. 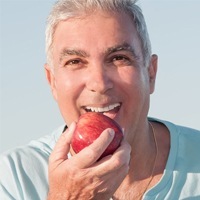 Removable dentures repair 20% of chewing ability, but an All-on-4 denture will restore 70% or more, meaning you can eat all of your favorite foods without worrying about a shifting denture. Traditional dentures require placement of implant posts along the jaw line. All-on-4 dentures utilize the naturally densest parts of the jaw at the front of the mouth. Two implant posts are still positioned vertically to support the front of the denture. Then, two are placed diagonally from the back of the denture into the densest part of the jaw in the front of the mouth.